Jonathan Trumpbour Matlack (born January 19, 1950) is an American former Major League Baseball left-handed pitcher. He was the fourth overall pick by the New York Mets in the 1967 Major League Baseball draft. Matlack also pitched for the Texas Rangers. In 1977, Matlack's record dipped to 7–15 with a 4.21 earned run average (he had entered the season with a career ERA of 2.88) for a Mets team that lost 98 games and finished last in the N.L. East. Following the season, Matlack was included in an unusual four team off-season trade that sent him to the Texas Rangers. The Rangers sent Adrian Devine, Tommy Boggs, and Eddie Miller to the Atlanta Braves, a player to be named later and Tom Grieve to the Mets and Bert Blyleven to the Pittsburgh Pirates. The Mets received Willie Montañez from the Braves, and sent John Milner to the Pirates. The Pirates sent Al Oliver and Nelson Norman to the Rangers. The Rangers later sent Ken Henderson (March 15, 1978) to the Mets to complete the trade. Matlack retired following the 1983 season. After four years away from the game, he was hired as pitching coach for the San Diego Padres' Arizona League affiliate. 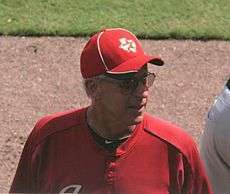 He also coached in the Chicago White Sox organization before he was hired as the Detroit Tigers' major league pitching coach in 1996. He is currently the minor-league pitching coordinator for the Houston Astros. John Matlack is now the pitching coach for the Glens Falls Dragons of the PGCBL. ↑ Kent Hannon (1976-09-13). "The Throes Of Frustration". Sports Illustrated. ↑ "Cincinnati Reds 5, New York Mets 3". Baseball-Reference.com. 1971-07-11. ↑ "New York Mets 2, Pittsburgh Pirates 1". Baseball-Reference.com. 1971-09-25. ↑ "Pittsburgh Pirates 5, New York Mets 0". Baseball-Reference.com. 1972-09-30. ↑ "1973 National League Championship Series, Game 2". Baseball-Reference.com. 1973-10-07. ↑ "1973 World Series, Game 1". Baseball-Reference.com. 1973-10-13. ↑ "1973 World Series, Game 4". Baseball-Reference.com. 1973-10-17. ↑ "1973 World Series, Game 7". Baseball-Reference.com. 1973-10-21. ↑ "1975 All-Star Game". Baseball-Reference.com. 1975-07-15. ↑ "Kansas City Royals 4, Texas Rangers 3". Baseball-Reference.com. 1980-08-19. ↑ Anthony McCarron (2008-11-29). "Where are they now? Former Met Jon Matlack Can't Stay Away from the Game". New York Daily News.